What's an 'unnatural crime' ? I think this may be what you had in mind? 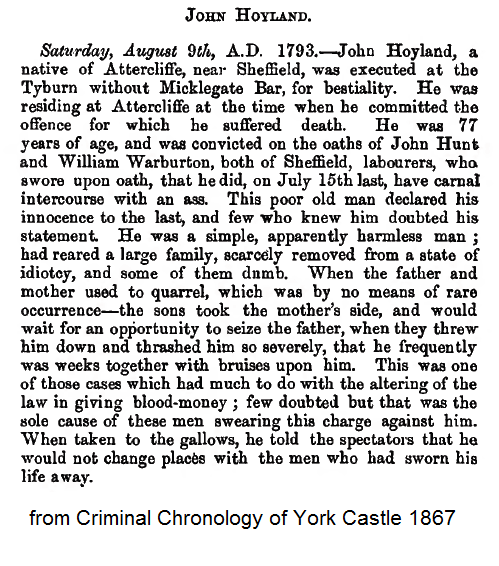 Alfred Waddington, of Sheffield, was this day executed at York for having murdered his illegitimate child, twenty months old, on the 18th of August previously. murder of Alexander Robinson, after having made a confession of his guilt. months old, on the 18th of August previously. Both were executed in January 1853. 1852 is what it says in the book. I just copied and pasted it. Alfred Hinchliffe, of Treeton, was found dead in Shirland Lane, Attercliffe, Sheffield, robbed and possibly murdered. The coroner's jury returned an open verdict. his step-daughter, Eliza Fisher, in Heptonstall Lane, Attercliffe, shot her with a pistol, but she ultimately recovered. He then shot himself with the same weapon, and lived till the 17th, when he died. In his case the coroner's jury returned a verdict of felo de se ; he was accordingly buried at midnight, and in the case of his stepdaughter a verdict of wilful murder was returned against him.